Our pond is the size of a hula-hoop. It had been frozen over and I had no idea if frogs could survive under the seal of ice. I wish I’d paid more attention in biology classes at school. I was thrilled when I lifted out the slabs of ice and saw three lively frogs swimming about in the melted water. 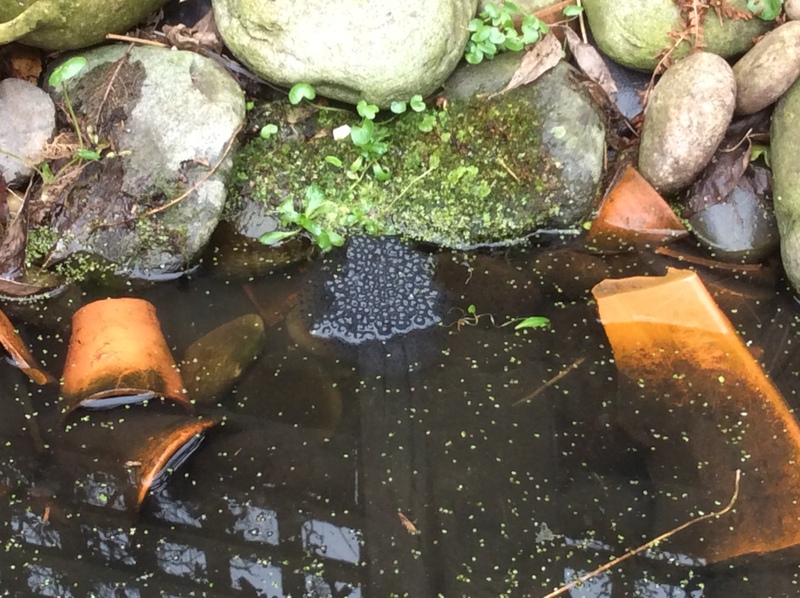 A few days later a lump of frogspawn appeared. Very happy about that. Even more exciting. Today I saw 14, yes 14, froggy heads peeping out of the water. No photo I’m afraid as they hear/see me coming and plop down into the water. I don’t know where they all came from so suddenly. 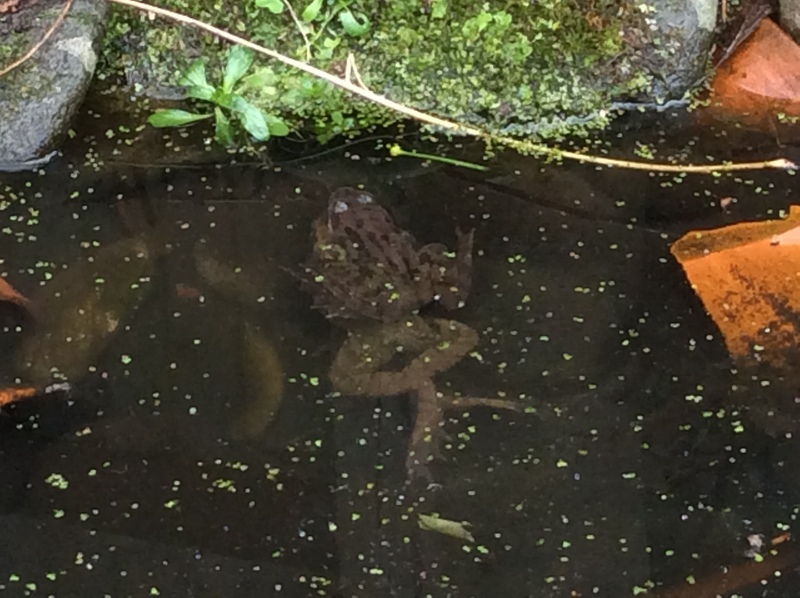 They look full sized frogs (or toads) so maybe they have been in the garden all winter. 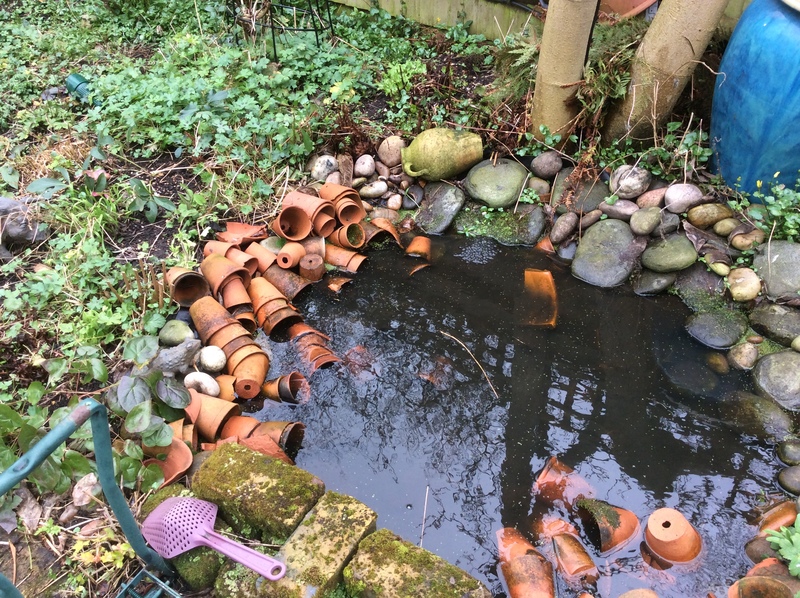 I think the secret of success is the old terracotta pots all around the edge of the pond and many have fallen in the water. Whole or broken, they make great places for wildlife to hide. I love the effect they make and how they add colour to the pond area. 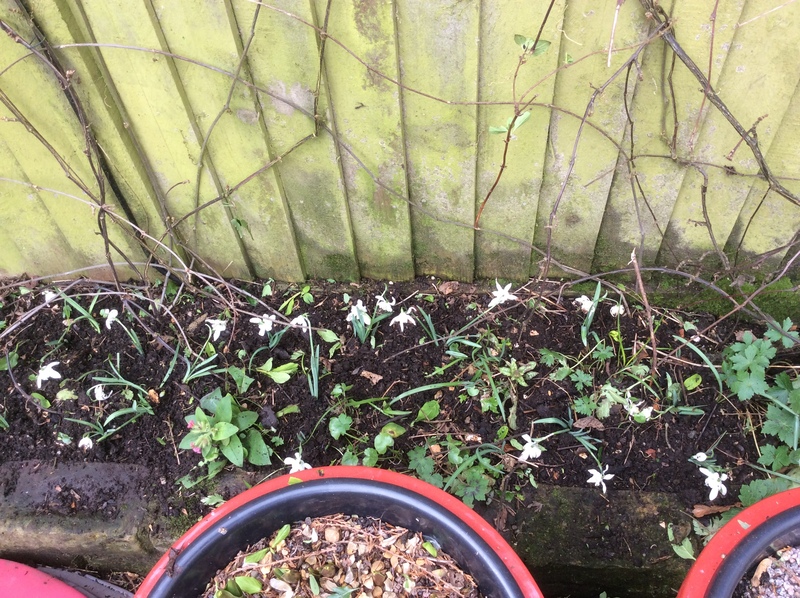 I bought bunches of snowdrops in the green at the February RHS Spring Show and popped the clump into a pot just as a temporary measure while I went on holiday. (called heeling them in). Today I planted them in twos and threes. They’re still flowering and this is the best time to plant them. They will die down soon and come up next year. It’s funny to be planting now something to bring joy and optimism next January. That’s gardening – always looking ahead. 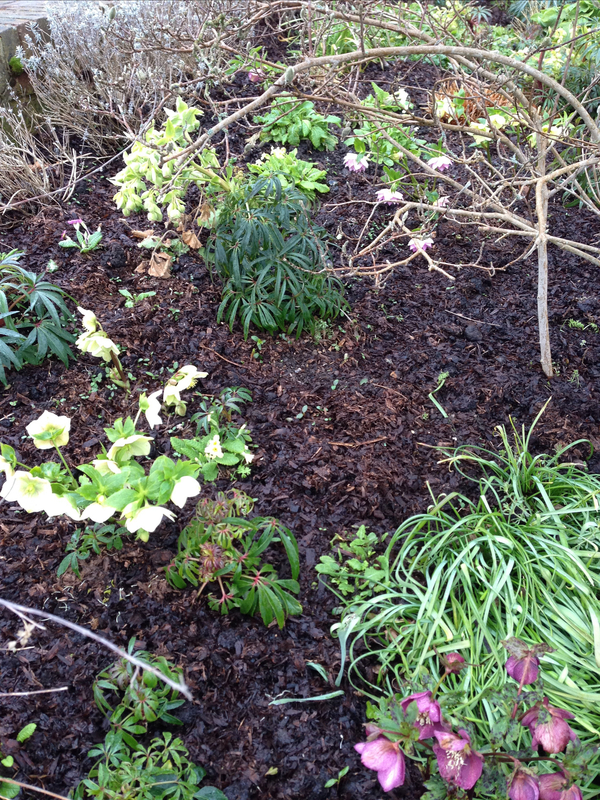 I saw a local front garden with a beautiful mulch of fine horse manure. It looked wonderful nutritious stuff and made the flower beds look dark and cared for. 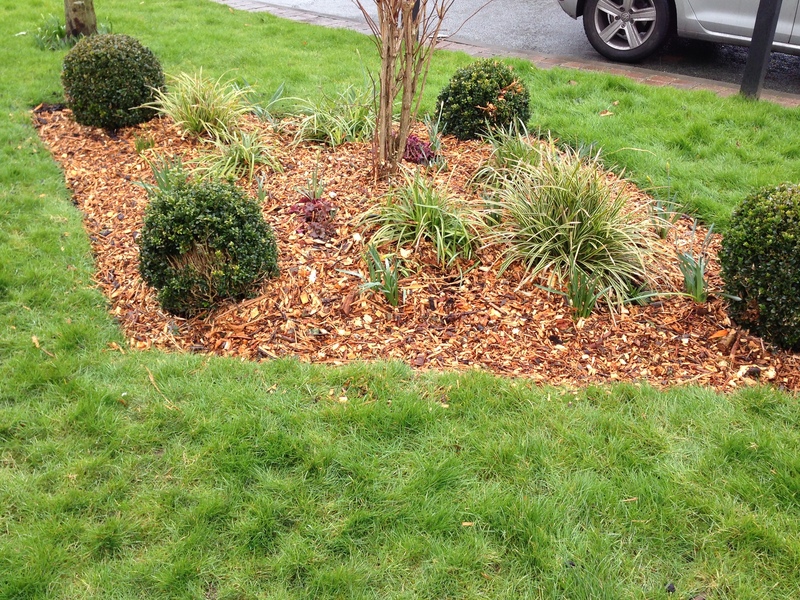 However, in the street a public area flower bed had been mulched with what looks like orange coloured wood chippings and I think it doesn’t look half as nice. Wood chippings will keep down weeds but the manure mulch will feed the soil in so many ways. A matter of personal taste of course. 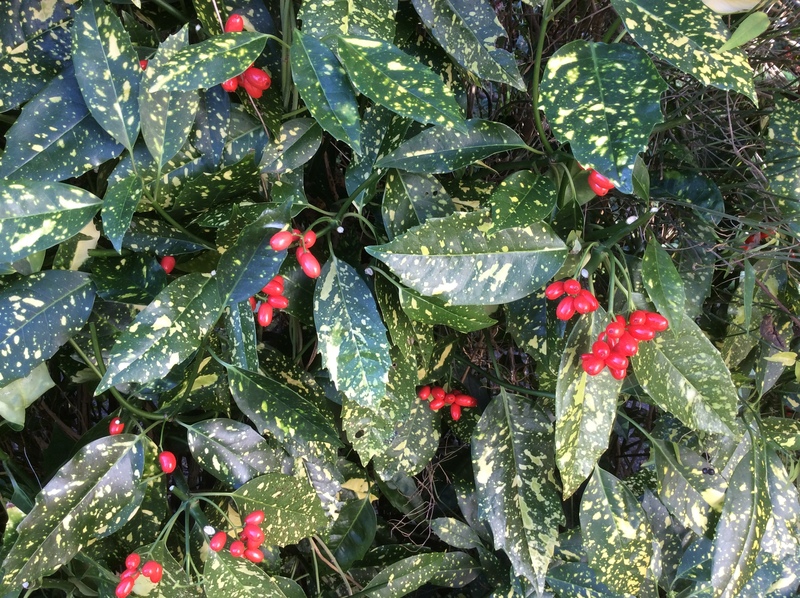 Spotted laurel is one of the commonest garden shrubs and I’ve walked past this one down our front path every day for 30 years. 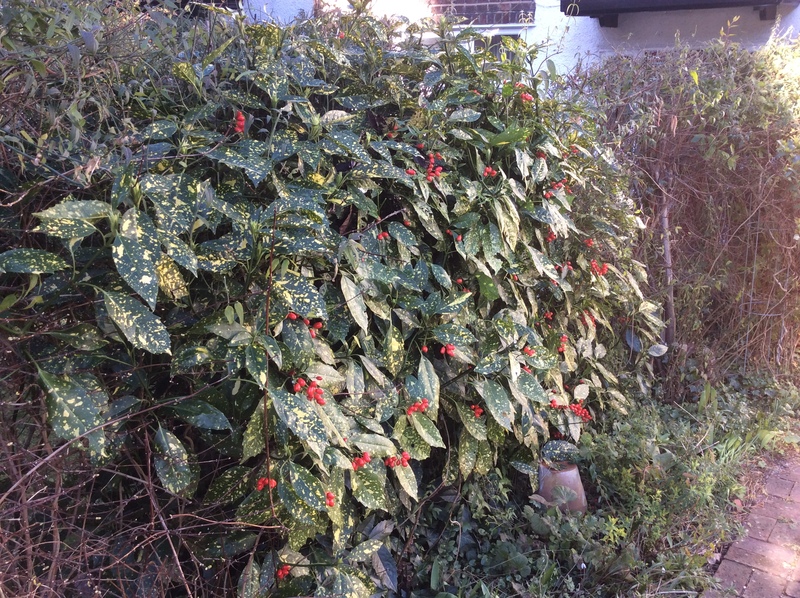 I can honestly say I had never noticed it had red berries – not consciously anyway. I read somewhere that to see them you had to cut back the foliage which was hiding them. I did that and lo and behold there were loads of berries!! Embarrassing to admit that I hadn’t known they were there before. You never stop learning with gardening (and yes, I managed to cut off some berries by mistake). 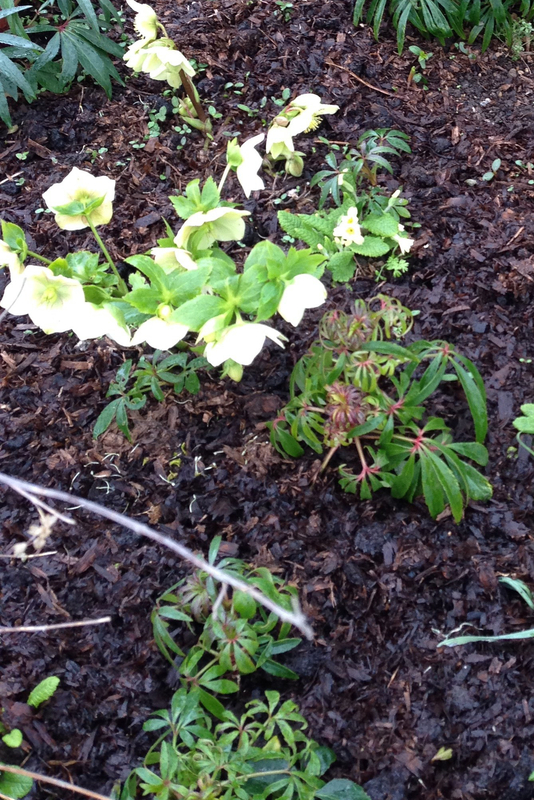 I wrote before that I am not a fan of dark maroon hellebores but look at this wonderful white one. I have a clump in the front – no idea where I got it from but it’s fab. 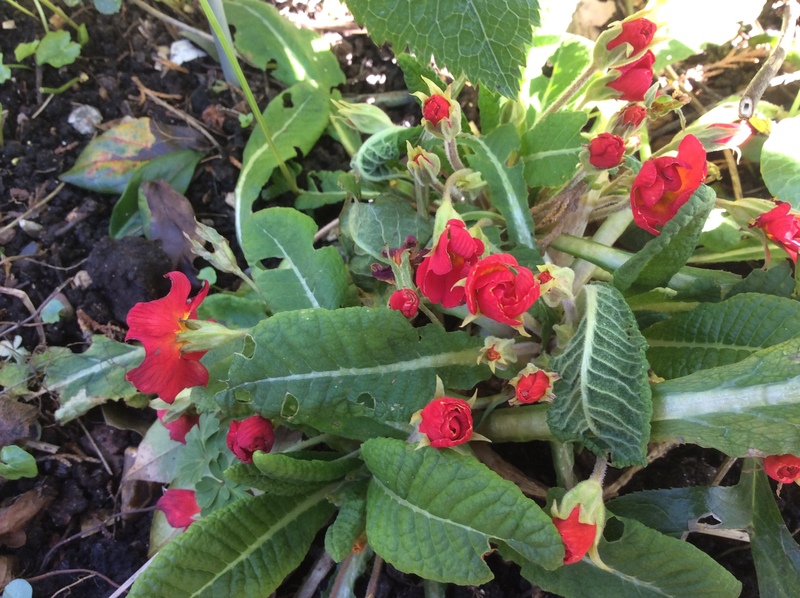 This is a lovely red primula called Don Keefe. It’s been nibbled and has become congested. It has several central points and the leaves are all going in different directions so I will dig it up, divide into little pieces and replant giving each piece a bit of space to spread. Thankyou to the propagator who hosts this Six on Saturday theme and over on his blog you can find other people’s sixes. 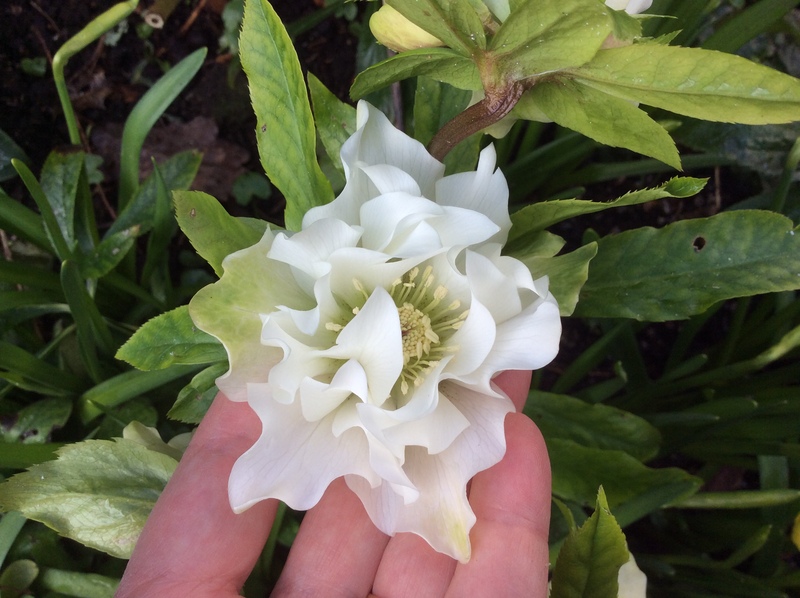 13 comments on "Six on Saturday 10th March 2018"
That is a stunning white hellebore! And I’m with you with the manure mulch. So satisfying to fling around, makes all the plants look stunning, and does the garden lasting good. Thankyou Ali, heaven knows where it came from and jolly hard to take a picture with one hand. Pity the flowers hang down – you could easily miss them. Isn’t mulch a yummy thing! I really like your terracotta pots in your pond. I’m sure they are real hiding spots for frogs. Is it a “wild” pond without filters or pumps? Ps: very beautiful double white hellebore! Thankyou Fred, yes it’s just a shallow hole lined with liner with no plants or anything in it except stones and pots. Probably a thick layer of silt at the bottom by now as we’ve had it for 4 years now. It nust be a frog festival because ours were at it today. Oh I’m glad it’s not just mine that are going bonkers. Thanks for your comment. Surely most councils collect garden waste and compost it. Why don’t they use that for mulching and put the tree gang chippings through the same process. I met prof Quinn in New York last week. Frogs are marvelous! I hope hedgehogs also survived winter in your garden. Gorgeous frilly hellebore! I can see your point about the primula needing division, but it’s lovely to see its bright blooms. Thankyou Mrs D, so unexpected find it as I don’t recall where it came from. Thanks for your comment. The terracotta pots look great in your pond. Lifting, dividing and replanting snowdrops is on my to do list for today. Thankyou Ciar, it’s so nice to share things that people like. Don’t you just love a Gardening to-do list. Have a lovely day.